Some hotels have a bowl of apples at the front desk. Others leave chocolates on your pillow. And there's one chain that boasts about its chocolate chip cookies. 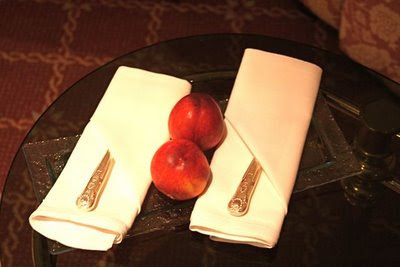 But I think Ashford Castle's welcoming touch was both original and lovely: two perfect, ripe and juicy nectarines. They were laid out on a glass plate with bottled water, silverware, and napkins -- a welcome treat as we arrived after a long day of driving. To read more about my experiences at Ashford Castle, check out my review. If you joined me from Wanderfood Wednesday, thank you! For more blogging about food, click here. I'm glad to hear they were ripe. We stayed in a hotel in Florence that had a fruit bowl full of perfect-looking but completely hard and unripe fruit on the breakfast table. It was like that all week, probably because they had to replace all the fruit that guests took one bite out of and then abandoned.